Each week, Big Issues focuses on a newly released comic-book issue of significance. This week, it’s Trillium #5. Written and drawn by Jeff Lemire (Green Arrow, Animal Man), the start of the miniseries’ second half spotlights Lemire’s innovative view of the relationship between narrative and form. No matter how great Jeff Lemire’s superhero work is (and his Green Arrow with Andrea Sorrentino has gotten pretty great), he always does his best work when he’s in complete creative control. The viewpoint of the material he writes and draws is vastly separated from that of contemporary superhero comics, telling deeply personal narratives with artwork that emphasizes emotional honesty over spectacle. 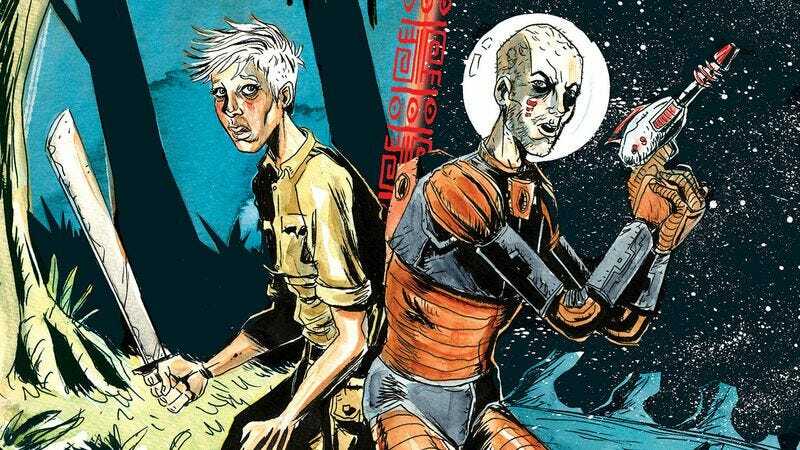 Each new solo project expands Lemire’s creative boundaries, and the Vertigo miniseries Trillium shows the cartoonist pushing harder than ever as he experiments with the medium in exciting new ways each month. A science-fiction romance about two people from completely different time periods, Trillium is all about perspective, and Lemire has used the time-bending plot to experiment with methods of depicting separate points of view with the opportunities afforded by comic books. The flip-book Trillium #1 was just the beginning of Lemire’s structural experimentation, although not all the layout changes have been as drastic as that first issue. There’s no flipping required for the series’ second chapter, which changes the shape of panels to show how William and Nika view the world differently: William’s pages stick to rectangular panels while Nika’s pages incorporate circles to give the futuristic character less traditional layouts. The flipping returns in #3 when the characters go back to their separate time periods, forcing the reader to turn the book upside down for William’s scenes, but #4 doesn’t mess with the structure at all, finishing the first half of the miniseries with its most conventional issue yet. After the cataclysmic events of last month’s chapter, William and Nika are not only separated again in Trillium #5, but also living in the other’s circumstances, which means it’s time to have some fun with panel layouts. Nika has assumed William’s place as a shell-shocked veteran in post-WWI England, and William is now a scientist working to save the human race in the year 3797. Yet they both feel the memory of a different existence haunting them. William and Nika’s past lives are literally under the surface because both stories appear on each page, bringing back the flipping element that seems like a gimmick on the surface, but is a vital storytelling tool in Lemire’s hands. The two protagonists haven’t spent much time courting each other in the traditional sense, but Lemire has built an incredible bond between the two characters by changing the reading experience when they are together or apart. When the lovers are separated, the comic has to be flipped, but everything straightens out when they’re together to make for a more comfortable read. The nature of those flips changes depending on the context of the story. The first and fifth issues have only one big flip when the focus shifts to the second character’s point of view, but #3 requires the reader to constantly rotate the comic for a more hectic plot. The characters are disoriented in that third chapter after being ripped through time, so Lemire disorients the reader by turning the book upside down every few pages. The techniques of the first and the third issue are combined in this week’s experiment, which apes the symmetrical structure of the debut flip-book while presenting half of the story upside down to show how William and Nika’s experience are bleeding together. The lovers may be separated in this issue, but they’re connecting on a more personal level than ever before by stepping into each other’s shoes, so their stories are presented on the same page to stress the intimacy being developed in their confusion. Like in the first issue, the split narratives follow identical panel layouts, a structural choice that is accentuated by showing both stories on the same page. Yet while the symmetry in #1 establishes the rhythm the two characters share in their lives, the split-page format of #5 makes the panels at the start of Nika’s story symmetrical with those at the end of William’s. They still follow the same rhythm, but it’s been switched because they’re out of sync with their new identities. Even without the unconventional story structure, Trillium is Lemire’s most ambitious solo work to date, showing an immense skill for world-building while developing a riveting character drama. His linework has never been more confident, realizing two widely varied environments in remarkable detail that still retains a crudeness that keeps the visuals grounded. The massive scope of his design skills is put on full display in two landscape panels showing the strange surroundings Nika and William have found themselves in: the top showing an industrial London skyline littered with metal air-ships, the bottom a desolate alien setting where a massive space cruiser is currently docked. That post-war city is bustling with life, whereas the alien planet is a place of death, a pit stop for the human race as it races toward extinction, and the two shots immediately evoke their respective atmospheres. José Villarrubia uses a more restrained color palette for the scenes set in the early 20th century, creating a sense of reality that contrasts with the more stylized watercolors Lemire uses to color events in the far future. When Nika and William experience brief flashes of their former lives, the panels switch coloring to stress the out-of-body experience felt in the moment they’re pulled into different, but familiar worlds. Every aspect of the visuals is working in service of the narrative, from the linework to the layouts to the colors, and Lemire’s unorthodox creative choices elevate the story to make each issue an exhilarating and surprising piece of art. There’s no way of knowing what direction Trillium will move in next, and that combination of innovation and unpredictability has helped make it one of the year’s strongest titles.